Sumérgete en las acogedoras aguas del mar Mediterráneo en un crucero de un día en catamarán por la costa de Mallorca. Navegue por la costa curvilínea en un lujoso barco y admire las vistas de las escarpadas formaciones rocosas y los impresionantes monumentos naturales. Nade y practique snorkel en paradas en varios lugares idílicos y disfrute de un delicioso almuerzo buffet en las suaves arenas de la playa de Fromentor, o en las hermosas playas de Es Trenc y Es Cargo, según la ruta que elija. Mallorca haciendo turismo y snorkel en un catamarán. Relájate y toma el sol en el barco. Sumérjase en el esplendor costero de la costa de Mallora durante un relajante crucero en catamarán. Seleccione entre dos lugares de salida y disfrute de una variedad de puntos de referencia naturales en los dos viajes visionarios. Crucero desde la parte norte de Mallorca Después de la recogida en el hotel, relájese durante el viaje panorámico hacia el puerto de Pollensa. 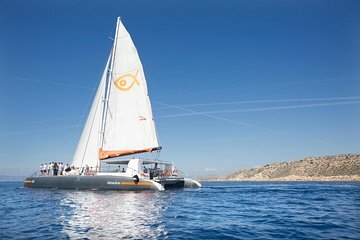 Suba a bordo de su elegante catamarán para embarcarse en su viaje a través de la maravillosa Bahía de Pollensa; Navegue sin problemas por hermosas playas como Mal Pas, Las Caletas y Barcarets y deténgase para sumergirse en las aguas cristalinas. Haga snorkel usando el equipo provisto y vea un cuadro diverso de la vida marina. Tome el sol español en la cubierta del barco y tome una bebida refrescante de la barra a bordo (por cuenta propia). Llegue a la famosa playa de Formentor y admire las arenas sedosas y la suave línea de costa; Permanezca a bordo del barco para disfrutar de un delicioso almuerzo buffet de carnes a la parrilla, ensaladas frescas y dulces, luego báñelo con un vaso de sangría afrutada. Disfrute del paisaje durante su regreso, navegue hasta el puerto de Alcudia, donde lo espera el transporte de regreso a su hotel. Navegue desde la parte oriental de Mallorca Suba a bordo de su catamarán en el pintoresco puerto de Palmer, ubicado en la Colonia Sant Jordi, y admire la belleza costera mientras navega hacia la playa de Es Trenc. Salpique y nade en las acogedoras aguas durante una parada relajada y luego continúe hacia las arenas de seda de la playa de Es Cargol. Disfrute de una pausa prolongada en el agua caliente durante una parada aquí y use el equipo de snorkel provisto para explorar las aguas poco profundas en busca de vida marina. Regrese al bote y aplaque su apetito con suculentas carnes a la parrilla, ensaladas frescas y dulces. Beba agua fría y refrescos refrescantes y relájese durante el pintoresco viaje de regreso al puerto. Haga un crucero desde la parte sur de Mallorca. Si su hotel se encuentra en la parte sur de Mallorca, salga del puerto de Palma de Mallorca y navegue por la sublime costa sureste. Consulte la sección de Itinerario a continuación para obtener más detalles sobre los lugares de recogida. • La zona norte incluye los siguientes lugares: Puerto Alcudia, Puerto Pollensa, Cala San Vicente, Playa de Muro, Can Picafort. • El área este incluye los siguientes lugares: Colonia Sant Jordi, Cala Santanyi, Cala Figuera, Cala Barca, Porto Petro, Cala Dorera, Cala Ferrera, Cala Egos, Porto Colom, Calas de Mallorca, Cala Domingos, Cala Murada, Cala Ratjada, Canyamel , Font de Sa Cala, Cala Mesquida, S'illot, Cala Millor, Cala Bona, Costa de los Pinos, Porto Cristo, Sa Coma. The Catamaran Cruise was absolutely fine. It was best happening of the whole week we spent. The ship was interesting and crew friendly. The lunch, weather, drinks and music were just perfect. Only thing we wanted that it should take couple hours longer than a half day approx four hours. More time for sailing and swimming . This trip is not for nature lovers, it is for drunk people that like loud bad music!!! What is billed as a 6.5 hour trip was only about 5 hours. They call it a snorkeling trip, but no equipment is provided, nor was it indicated you had to bring your own. They book the trip to the max with barely enough seats for everyone. The lunch was good, but serving soo many people in a small area was very crowded. They try and upsell you to be able to sit on the bow of the boat. 20 euros gets you a big pillow and 2 drinks. You are under engine power for 95 of the time with only a small sail out for a short period. Great scenery and a pleasant day with nice weather. Pick up was a little late, catamaran was very crowded, which made it a bit uncomfortable. They need to cut down on numbers by at least 15 people. Crew very friendly. Swim stops were good. Lunch also good, with chicken, pasta, and bread. All in all a good day out for the money. Very nice value for the price! Drinks were very well priced, and the food was good. The catamaran was nicely equipped and the crew was very nice and welcoming. Only dissapointment was there were only two stops for snorkeling. Overall, I recommend this excursion! The trip was fun. The company running the trip were great. Good food. Trip last 4 hours. Viator could do with knowing a little bit more about the trips they are booking for. They were not really able to help enormously with my questions. I would be skeptical about booking with Viator again. The crew were nice and friendly. Lunch was great. The only thing was that this is not a snorkeling trip as we had to pay for the equipment so it's not included as it said on the invoice. The trip lasted shorter than expected. We had a great time, the end was a bit confusing, it was not a round trip. This tour has just lunch during 2 hr free time at one place and nothing else. Pick up /off service wasn't provided with the reason that we stayed in the center of the city. They didn't even mention about snorkeling and also didn't include snorkeling equipment. You have to pay for the beverage except for the lunch time. For the staffs, it seems like it was the time for selling the beverages becuase people has nothing to do on the deck. Also staffs are not helpful, not supportive, and not kind. The cost is very expensive when considering its services and conditions.